In 2017, there is no doubt that businesses consider social media to be a valuable tool in marketing strategy. 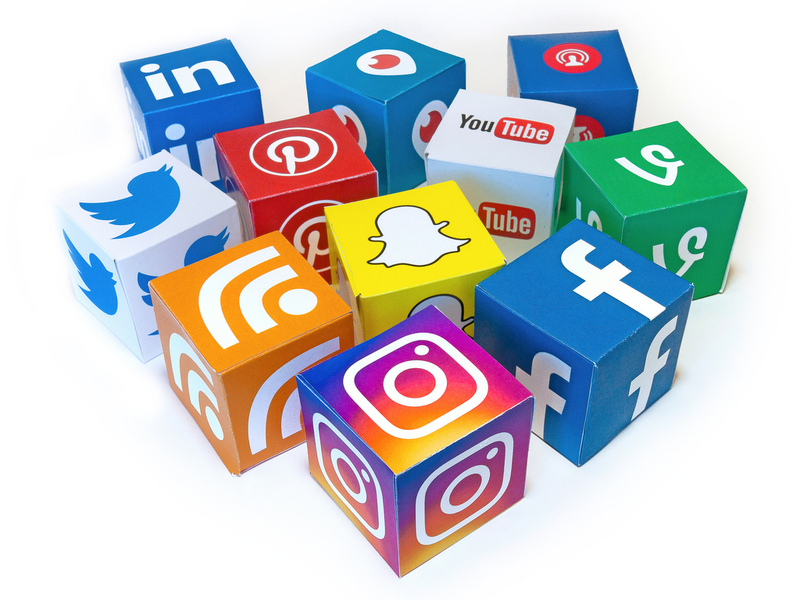 It is undeniable that being able to engage with customers through platforms such as Twitter, Instagram, Facebook and Snapchat assists businesses in building brand awareness and ultimately increasing sales. Having a social media strategy implemented is the simple part but measuring the value of social media is one of the toughest challenges that marketers face. What does all the following, liking, hashtagging and posting really do for your business? A social media audit is the process of analysing what’s working, what’s not working and where there is room for improvement across the firm’s media channels. It captures what users are saying about their brand, what competitors are doing and how the business itself is performing online. The first step in conducting a social media audit, is to compile all of the organisations’ social media metrics so you can begin to evaluate the overall results. 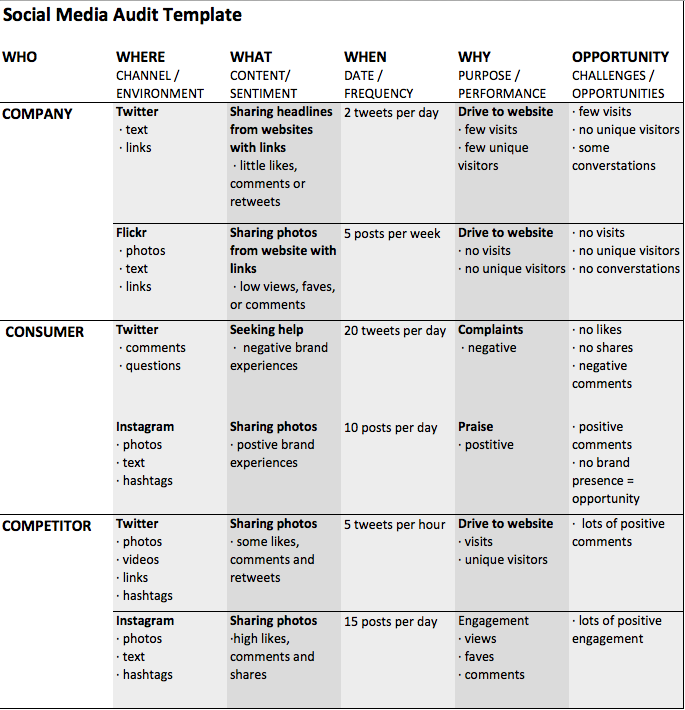 Conducting a social media audit using an analysis template assists businesses in figuring out each platforms purpose and key performance indicators. Below is an example of a best practice template from Harvard Business Review, which can be used as a guide to help structure the analysis. It categorises the evaluation firstly into each channel your business is present, what content is being posted on each, the frequency of posts and the purpose of posts. Finally, the weaknesses and opportunities of each channel are identified to determine appropriate actions in the social media strategy. In this example, Twitter is identified as having a poor performance as it is driving little traffic to the website, which is meant to be the key purpose of posting. Based on the competitor’s activity, the company should consider posting more visual content and increase the frequency of posts to drive more consumers to the website. Analysing your competitor’s social media activity can be a useful tool to establish what platforms they are currently operating on, what content they are posting, and whether this appears successful or not. By doing this the company can consider what can be done better and what else needs to be incorporated into its social media strategy that other competitors are doing , providing a competitive advantage to the business. What channels are your competitors present on? How regularly are they posting? What are their levels of engagement like? Which competitor is the clear leader? What are consumers saying online about their brand? STEP FOUR: Make it count! During the social media audit, your business may have discovered that it’s not posting frequently enough for example, or maybe it’s not using the correct channels. After conducting the audit, you should be able to propose recommendations on how to be more successful across all platforms. Implementing these recommendations is how your organisation can take its social media success to the next level. Ft.com. (2017). Auditing to be less of a burden as accountants embrace AI. [online] Available at: https://www.ft.com/content/0898ce46-8d6a-11e7-a352-e46f43c5825d [Accessed 27 Nov. 2017]. Harvard Business Review. (2017). Conducting a Social Media Audit. [online] Available at: https://hbr.org/2015/11/conducting-a-social-media-audit [Accessed 27 Nov. 2017]. HuffPost. (2017). 7 Steps for a Successful Social Media Audit. [online] Available at: https://www.huffingtonpost.com/entry/7-steps-for-a-successful-social-media-audit_us_596900bae4b06a2c8edb4618 [Accessed 28 Nov. 2017]. Tuten, T. (2015). Social Media Marketing. [S.L. ]: Sage Publications. Brown, E. (2012). Working the crowd. London: BCS.